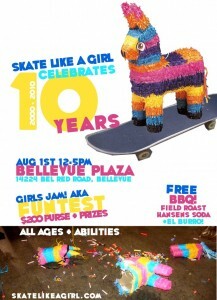 Skate Like A Girl Turns 10!! It was an incredible 10 years ago in the Summer of 2000 that Holly Sheehan and Fleur Larsen ran their first girls skateboard clinic at Ladyfest in Olympia, WA. That small skate crew has grown into a volunteer run non-profit organisation with three projects in Seattle, Portland, and San Francisco. You can help them celebrate by coming to the party on August 1st at Bellevue Plaza. There will be a free BBQ for the first 100 people, some product give aways, some fun games and of course the skate clinics. And what’s a party if there isn’t a piñata? BOOM! Fun for all ages. Boys should come out and support too – there will be a game of SKATE for you as well! On top of that, rumor has it we will have ladies coming from all over the West Coast of North America: Oregon, California, Montana, and our favorite skateshop in Vancouver – Anti-Social and some ladies from Australia will be jamming with us!